In the tasting room there were some historical displays which we took some time to look at. We also climbed down a narrow wooden flight of stairs to the cellar beneath, where large barrels and vats of wine were stored in cool conditions. A thermometer on the wall indicated it was 14°C in the cellar. Back upstairs we sampled several of the wines at the tasting counter. The specialty of Clare Valley is the Riesling, and we liked the ones on offer here. We bought a half dozen bottles of various wines and had them shipped back home. The lady pouring the wines for us was very chatty and asked what we were doing for lunch. We said we hadn’t booked anything yet and she said we had better, as things get booked out on Sundays, and especially today being Mother’s Day. So she rang around a couple of places for us and found us a table at The Rising Sun Hotel for midday, though we had to be out by 13:30. We said that would be fine, because we knew it would be difficult showing up at places and expecting to get a table for lunch. 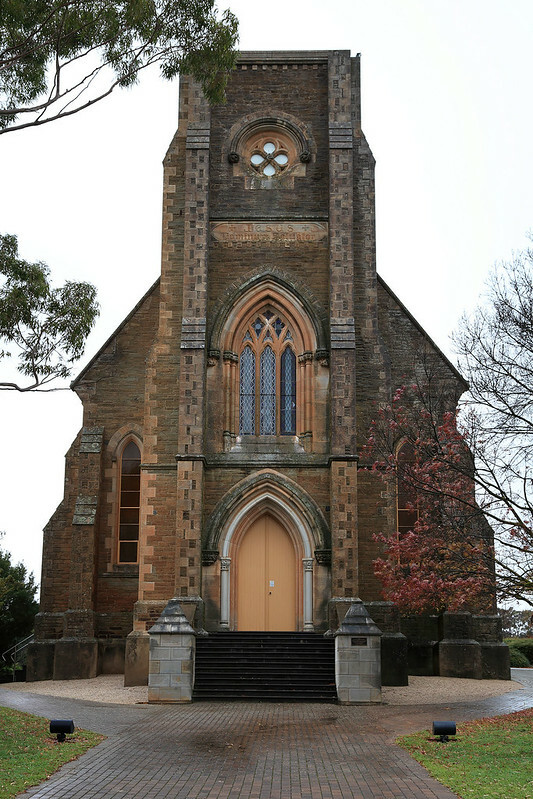 The rain had stopped when we emerged, and I took the chance to snap a few photos of the old church building before it started up again. It would rain on and off all day, with the showery bursts being quite intense. In the breaks occasionally some sun would peek through, creating rainbows a couple of times. Some of the driving we were doing was on dirt roads, and these became slicked with mud, so I drove carefully to avoid losing traction. The hire care is filthy from the muddy splashes. 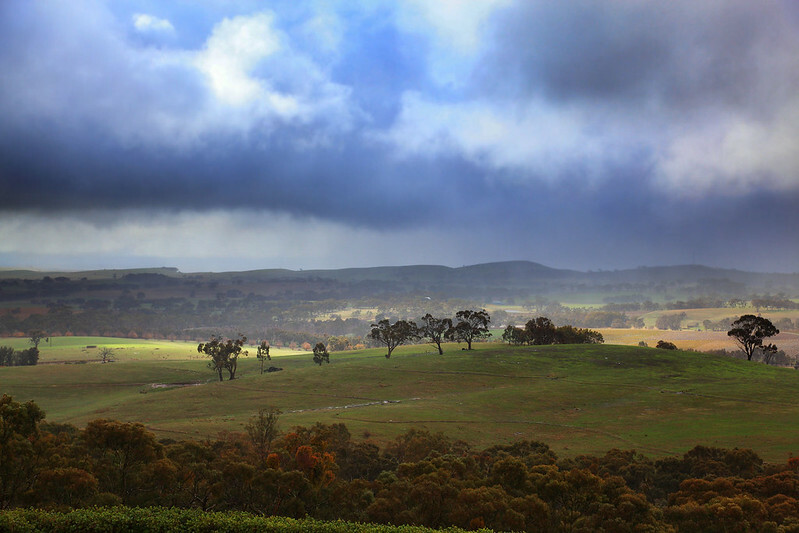 Storm over Clare Valley, from Paulett Wines. From Sevenhill, we drove the short way to Paulett Wines. Their tasting room was situated on a ridge top overlooking the valley below, with picturesque vineyards spilling down the hills. The balcony would have been a great place to take some scenic photos from, but it was roped off as there was construction work in progress and there was no railing to prevent falls. Nevertheless, I took some photos through the glass doors as the rain swept in and cleared away in shifting sheets of colour and grey over the hills in the distance. The wines we tasted here didn’t match the ones from Sevenhill, and we didn’t buy any from this place. Done at Paulett, we had to drive south to the town of Auburn for our lunch appointment at The Rising Sun Hotel. This was an old historical hotel building, which had a bar at the front, and then several rooms and a corridor turned into a restaurant simply by placing dining table in them. We were seated at a table in the corridor, with three other tables of people. The corridor was wide enough for the waitresses to have room to deliver plates to each table. At the table next to us a couple with a toddler girl sat, and the girl kept turning around to stare at me. 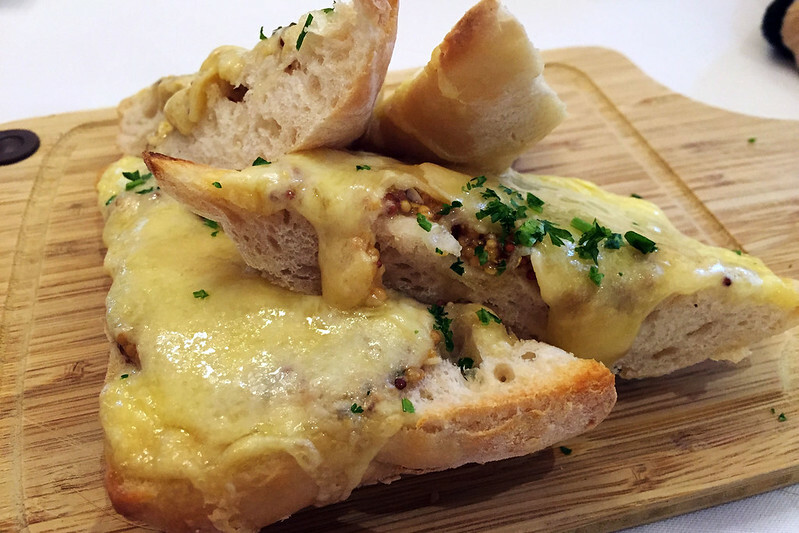 Mustard and cheese ciabatta, The Rising Sun Hotel, Auburn. We ordered some mustard and cheese ciabatta for starters, which turned out to be the bread spread with seeded mustard and topped with grilled cheese. It was delicious. M. then had the battered barramundi and chips, while I ordered the fish pie. This was a large ramekin full of a mixture of mashed potato, salmon and cod pieces, chopped scallops, and peas, topped with melted cheese. It was delicious and came with an interesting salad made of long thin ribbons of sliced cucumber, radish, red onion, and I think celeriac, with a lightly herbed dressing. M.’s fish and chips came with a green salad of lettuce and cucumber with tomato and red capsicum. Having tasted several wines already in the morning, we declined to drink any with lunch. After eating, we drove back north to check out more wineries. 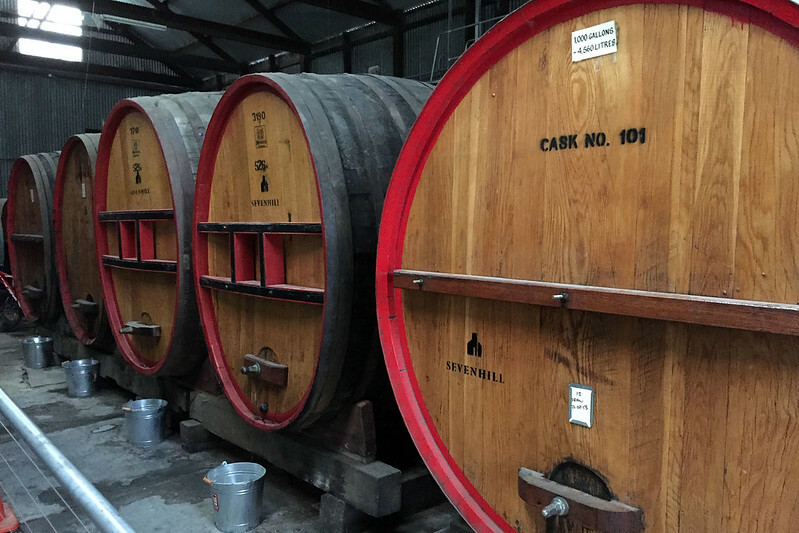 The first stop was Pike’s Wines, which also had a brewery on the premises. We checked the wines first and ended up ordering another half dozen bottles to be shipped home for us. Then we went to the Pike’s Beer Company brewery building nearby and a friendly guy there gave me tasters of the three beers, a Pilsner lager, a sparkling ale, and a stout. I liked the ale and stout and wanted to order some delivered home for us. The guy said we could go to the wine tasting room and order them there! Apparently the brewery has only been in operation for a few months, and they haven’t even set up a procedure for shipping cartons of beer from the brewery counter yet. 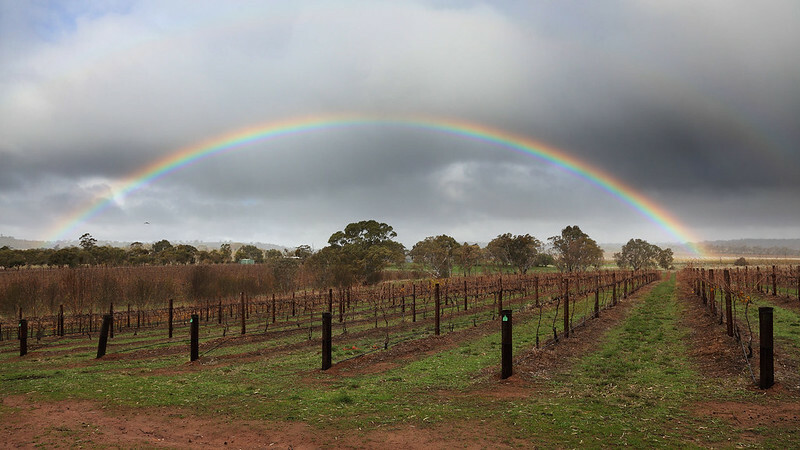 Rainbow over vineyards, Pike’s Wines. From there we drove to our fourth winery of the day, Annie’s Lane. We got a little confused since our map listed an actual road called Annie’s Lane, and in it was marked a location named Annie’s Lane Reserve, but when we got there we found it was just a big grassy area. Then I realised looking at the map that it was a reserve, as in a park, and the Annie’s Lane winery was actually a few kilometres away! So we drove there and parked in front of the attractive building housing the tasting room. It also had a couple of rooms of museum displays of historical winemaking equipment and memorabilia, as well as a room of local artworks for sale. The paintings were interesting, all of the artists having a distinct childlike and almost amateurish quality to their work. Back in the tasting room we worked our way from Rieslings through to some Shiraz and a Shiraz Cabernet blend, as well as a Botrytis Riesling dessert wine which was very nice. We ordered a mixed half dozen of these wines for delivery as well. When we get home we are going to have a lot of wine and beer to store! The tasting room also had some displays of preserves and chocolates and things, including a big jar of the most enormous chocolate bullets ever. They were selling for 40 cents each. I had to buy two of them, and M. got a couple of small wrapped squares of 70% cocoa chocolate. Eating the bullets later, we discovered they were short pieces of the thick soft licorice like Darrel Lea makes, about 3cm long, coated in several millimetres of chocolate. Monkey and the giant chocolate bullet. We left Annie’s Lane about 16:00 and planned to go to Vine Art Studio to have a Devonshire tea for an afternoon snack. But when we got there we discovered that they only open Wednesday to Saturday, so were closed today. So instead we drove back to Sevenhill and The Little Red Grape Bakery, where we got an apricot slice to share and M. got a cafe latte to drink. The apricot slice was a thick slab of rich preserved apricots sandwiched between layers of short pastry. It was thick and fruity and delicious. From there we drove back to our motel. We checked with reception to see if we could get a table at the motel restaurant for dinner, but the lady said the restaurant didn’t operate on Sundays. So we are planning to head into Clare to get a simple dinner of sandwiches from Subway, to make up for the rich lunches and snacks we’ve been having. We had a very simple dinner tonight, heading into Clare to buy sandwiches at the Subway there. M. had a veggie delite with cheese, while I had a chicken strip sub. We arrived at 19:30, just half an hour before they closed at 20:00, and two very bored looking young women appeared from a room out the back to serve us. I asked if it was a quiet night and they said extremely quiet. At least we gave them something interesting to do for a couple of minutes! After we ate, we drove back to the motel for our second night in Clare. This entry was posted on Friday, 28 August, 2015 at 16:52	and is filed under Diary. You can follow any responses to this entry through the RSS 2.0 feed. You can skip to the end and leave a response. Pinging is currently not allowed.